All videos and DVDs are kept behind the Circulation Desk on 1st Floor; ask for them by call number and make note if the item is VHS or DVD. Streaming video is also available to watch on your computer via the library search below or by searching Films on Demand. The following databases search current and historical periodicals (journals, magazines, and newspapers). To find articles and film reviews, search by general topic, film, cinematographer, director, writer, performer, etc. You can also limit by date. 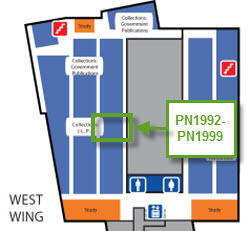 Books on Film Studies are in the Miller Center Basement and have call numbers beginning with PN1992-PN1999. All videos and DVDs are kept behind the Circulation Desk on 1st floor; ask for them by call number and format (VHS or DVD).